Maybe Guitar Hero can be useful to musicians after all. Customised versions of the controller that comes with the game are nothing new - they´re all over the internet, in fact - but as far as we know, Slapyak´s is the first to turn said hardware into a full-on MIDI controller with a 5-pin socket. This new mod is based on the Wii version of the controller and enables the user to play over two octaves of an eight note scale (the octaves being played can be changed should you wish). To use it, you simply need to plug it into the MIDI-compatible instrument of your choosing. 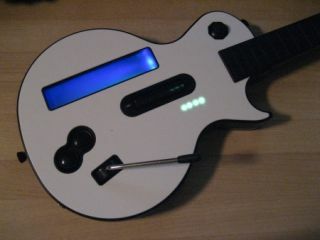 Of course, playing this controller is one thing - actually building it is quite another. If you want to give it a try, you´ll find instructions on the Slapyak website - just don´t come crying to us if it doesn´t work properly. You can watch a clip of the controller in action here.